Butterflies LIVE! in the Conservatory is only part of the fun. See native butterflies like skippers, monarchs and swallowtail butterflies just to name a few. We’ve planted nectar and host plants for our local butterflies all over the Garden! Check Out Kaleidoscope Point located in the Bird and Butterfly Meadow in the Children’s Garden, including the self-directed Butterfly-themed NaturePlay. Visit the Monarch butterfly waystation located there, too. This site provides milkweed, nectar sources and shelter needed to sustain monarch butterflies as they migrate through North America. 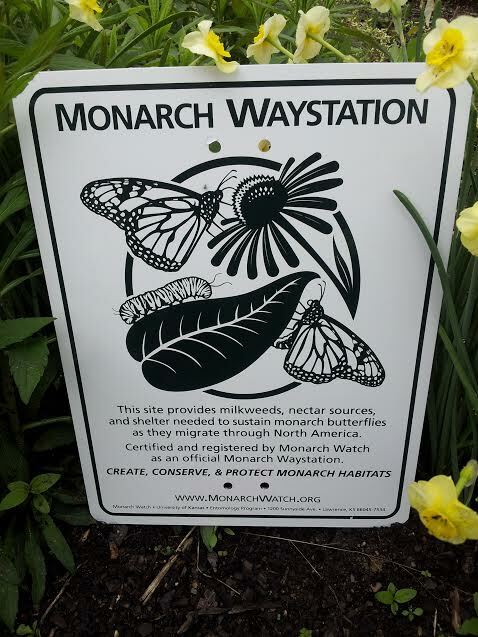 Certified and registered by Monarch Watch as an official Monarch Waystation. Butterflies LIVE! KidQuest: Pick up a KidQuest brochure in the Butterflies LIVE! exhibit in the Conservatory, or download and print your own KidQuest PDF. You’ll have fun searching for these clues. You’ll learn why butterflies are attracted to certain plants, why they have such colorful wings, how they taste with their feet and more amazing facts. A major initiative of the Pollinator Partnership, National Pollinator Week recognizes the importance of pollinators to ecosystem health and agriculture in the United States. Through partnerships, it increases awareness and support for protecting and sustaining pollinators. Join us in the Children’s Garden where you can learn how to do the bee dance and participate in the “Who’s Pollinating the Garden?” activity.